The ghost of Cotton Mather has made another appearance in modern America: this time in a Young Adult novel about bullying. How to Hang a Witch is the debut work of Adriana Mather, a Mather of the Mathers. Now she’s turned her personal history into a bit of fiction. The heroine of the new novel How to Hang a Witch is also a Mather of the Mathers. The 15-year-old protagonist moves to Salem, Mass. with her stepmother, only to discover that her family’s connection to the witch trials make her a target of the witches who dominate her school. Also there’s a ghost boy and a whisper about a Mather-family curse. “‘Like that?’ He nods toward a guy and a girl entering the room. The guy wears an expensive–looking black button-down shirt, black pants, and black loafers. And she has on a floor-length black dress with a tailored black blazer. Her hair is a perfect bob. Mather’s ghost thus provides pop culture another modern lesson in how not to be a bully. This entry was posted in Blog, book, News and tagged Adriana Mather, Cotton Mather, history, How to Hang a Witch, reception history, Salem on 23/08/2016 by Daniel Silliman. Jonathan Edwards didn’t know of Oklahoma. The word wasn’t even coined until 108 years after he was dead. But do Oklahomans know Jonathan Edwards? The question is surprisingly controversial at the moment. A Republican Oklahoma state representative named Dan Fisher, who is also pastor of a Baptist megachurch, has proposed a bill that would defund the teaching of Advanced Placement United States History courses in Oklahoma high schools. AP classes are taught to about 500,000 high school students every year in the US, putting them on the fast track to college education. The AP guidelines for teaching US history was revised in 2014 and Fisher, like many of conservatives, is critical of the new framework. One of those heroes, according to Oklahoma House Bill 1380, is Jonathan Edwards. Fisher is afraid Edward, along with others, is being kept out of the US history classroom. The legislation would require that Edwards’ sermon “Sinners in the Hands of an Angry God” be taught to advanced high school students, along with two other Puritan texts, John Winthrop’s “A Model of Christian Charity” and the Mayflower compact. Fisher’s proposal was passed last week by the Oklahoma house’s education committee with an 11-4 vote on party lines. The news was met with considerable scorn and outrage. Many on the left see this bill as an example of the American right’s head-in-the-sand anti-intellectualism. Conservatives, it is alleged, can’t handle the truth of American history. They want a of national ideology to overwrite the complexities of what actually happened. That’s a pretty cynical interpretation of Fisher’s bill. While these are cynical times, there’s nothing in the text of HB 1380 that supports the idea that Oklahoma Republicans would require high school teachers to leave some facts out of their education plans. There’s nothing in the bill that says teachers have to teach America’s greatness without including any voices critical of that national narrative. There’s nothing that says the goal of education should be instilling students with a belief in American exceptionalism. If you actually read Fisher’s piece of legislation, it proposes that advanced placement history curricula in the state “shall include as part of the primary instruction” documents related to America’s founding. These are, in the main, defined quite broadly. The bill mentions “organic documents from the pre-Colonial, Colonial, Revolutionary, Federalist and post-Federalist eras,” and “United States Supreme Court decisions.” Where it gets more specific, the bill proposes requiring high school teachers to teach a varied list of historical texts in their advanced classes. Some of these certainly articulate conservative visions of America’s special place in the world, but not all. There are three Ronald Reagan speeches on the list, but two by Lyndon B. Johnson. This proposal would require students study women’s-rights activist Elisabeth Cady Stanton and abolitionist Frederick Douglass, John Steinbeck’s class warfare novel Grapes of Wrath and even the words of the black nationalist Malcolm X.
It’s silly to say this legislation would forbid the teaching of America’s dirty, conflicted and complicated past. While Fisher no doubt wants to reject a narrative where America is a “nation of oppressors and exploiters,” he has not proposed a curriculum that would suppress all accounts of oppression and exploitation. If you read the bill, that’s just not what it says. The first part of this is the development of historical thinking skills. The skills are listed: chronological reasoning, comparing and contextualizing, crafting historical arguments using historical evidence, and interpreting and synthesizing historical narratives. Most historians are more circumspect about the political potential of historiography. A more immediate and tangible reason to “internationalize” American history is that it provides perspective. It seems unlikely that these contextualizations would make anyone more or less conservative. They’re certainly not committed to getting anyone to love America more — or less. The focus, pretty simply, is on improving the understanding of Jonathan Edwards by doing the work that historians do. Fisher seems to think the AP framework, which focuses on teaching skills like contextualization, is incompatible with teaching texts like “Sinners in the Hands of an Angry God.” At least as the Jonathan Edwards Center Germany approaches it, this just isn’t true. A conservative might interpret some of these as politically objectionable. One is “Identity” and, according to the framework, that theme pays “special attention given to the formation of gender, class, racial, and ethnic identities.” The first three segments of the Identity section, however, are given to very traditional debates about America’s national identity at the context of the founding and the new republic, the context of territorial expansion and Manifest Destiny, and the context of America’s involvement in two World Wars and the Cold War. Another section focuses on “economic, political, social, and ethnic factors on the formation of regional identities.” Another, migration and assimilation. This is hardly a leftist curriculum; there’s nothing honestly controversial here. To do this, AP teachers assume their advanced students come with a basic knowledge of American history. This seems to be Fisher’s biggest misunderstanding of the courses’ he has proposed to defund. There are not basic classes. These are not classes that every student has to have in order to graduate. They are classes for advanced students who know a little something about America’s history and are ready to be challenged to ask the kinds of critical questions that Fisher himself is trying to ask: How were these narratives constructed? What political influences were involved? How do different focuses change the narratives? This was a point that several high school teachers who teach these AP history classes in the state have made. “My job is to help students view multiple perspectives and evaluate what are the merits of each,” Matt Holtzen, an AP history teacher at Enid High School in Enid, Oklahoma, told Newsweek. If the framework doesn’t mention specific texts that Fisher wants to make sure are taught, that may be because they’re obvious to high school history teachers, according to Eugene Earsom, who taught in Oklahoma for 20 years before becoming the state’s Department of Education’s director of the social studies curriculum for seven years. Asked about Fisher’s proposal that advanced classes be required to teach John Winthrop and Jonathan Edwards and a list of other canonical history texts, Earsom said, “I don’t know of any history teacher who is worth his or her salt that doesn’t teach all of these already.” Edwards might not be taught in the advanced history classes, but that’s because his most famous sermon has already been taught Oklahoma’s high schoolers. The political question remains open in Oklahoma, as Fisher’s bill is currently being revised, following the backlash. The controversy has already answered another question, though: Oklahomans do know Jonathan Edwards. This entry was posted in Blog, News, Uncategorized and tagged 21st century Edwardsians, Dan Fisher, history, Jonathan Edwards, Jonathan Edwards Center Germany, Oklahoma, reception history, Stievermann, teaching, Theusen on 23/02/2015 by Daniel Silliman. George Whitefield: Lessons from Eighteenth Century’s Greatest Evangelist by Thomas Kidd, at Southern Seminary. This entry was posted in Event and tagged history, scholarship, speech, Thomas Kidd, Whitefield on 16/05/2014 by Daniel Silliman. Of interest to those of us here at Heidelberg who had a chance to study with Prof. Raboteau last year, there is a conference at Princeton being held in his honor. 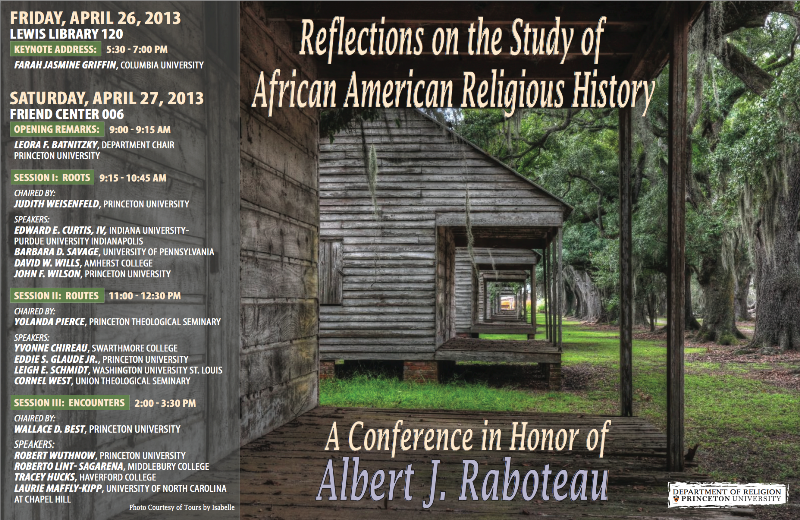 Held at Princeton next month, the conference is called Reflections on the Study of African American Religious History. Talks are organized around the themes of roots, routes, and encounters. This entry was posted in Blog, news, News and tagged African American, Albert J. Raboteau, history on 15/03/2013 by Daniel Silliman. Thinking about Jonathan Edwards in his own time is difficult enough. Grasping Edwards as a theological figure today presents its own sets of unique problems. Understanding how Edwards figures on the contemporary landscape requires a lot of a kind of back-and-forth cultural translation: allowing but then also critiquing (but then also still allowing) reconstructions, appropriations, and reanimaitons, as one attends to how 16th century theology is made relevant and applicable in 21st century theology. It’s one part reception history, one part history of ideas, one part discourse analysis. And the added complication: one has to do history, but then also set it aside, too, as the figure of Edwards at work in contemporary theological thinking is decidedly ahistorical. One good place to start, to get a sense of how Edwards is talked about theologically right now, is with these videos of Doug Wilson talking about Jonathan Edwards. From that position, Wilson argues with Edwards on some points (in particular having to do with Edwards connections to present-day evangelicalism) and praises Edwards and feels himself challenged by Edwards on other points (“This was a man absolutely marinated in scripture“). Especially of interest to those trying to figure out Edwards present shape or form in theological thought is the last video, where Wilson connects Edwards’ thought with the theology of C.S. Lewis and John Piper, specificall with the theology Piper has promoted, Christian Hedonism. This is one of the main ideas of Edwards — as it’s used and understood and talked about in certain circles of contemporary American Christianity. In Edwards, one can find these ideas even in his very oldest extant sermon, circa 1720 or 1721, where he argued for a necessary link between Godliness and hapiness, starting from exactly this foundational psychological idea that all people seek happiness. For Wilson, as well as Piper and a circle of Reformed Christians in American today, this insight serves as a starting point for understanding and explaining Calvinism. This is a key way in which Edwards “lives,” theologically, right now. Curiously, there’s another near-contemporary figure who starts from this same place and has this same “disciplined understanding of what makes human beings tick,” as Wilson describes it, but who ends up somewhere very, very different: Ayn Rand. She called it the virtue of selfishness. The ideas are not the same, of course. The trick is articulating why. Which is the history of ideas part of the back-and-forth cultural translation of the tricky business of trying to understand Edwards in our time. This entry was posted in Blog and tagged Ayn Rand, Calvinism, Christian Hedonism, Douglas Wilson, free will, history, John Piper, Jonathan Edwards, psychology, reception history, Reformed, scholarship, theology on 21/06/2012 by Daniel Silliman. Albert J. Raboteau, recipient of the first James W.C. Pennington Award. Studying that faith and that history has been Prof. Raboteau’s life work. The Henry W. Putnam Professor of Religion at Princeton University, he is the author of the seminal book on Christianity among American slaves, Slave Religion: The ‘Invisible Institution’ in the Antebellum South. He has further explored the African-American history of faith in Canaan Land and African American Religion: Interpretive Essays in History and Culture. He reflected powerfully on his own relationship to that faith in A Sorrowful Joy, where Raboteau speaks of his own spiritual journey, and A Fire in the Bones, which opens with a beautiful essay on how faith and history intertwine. The lecture is open to the public: June 14, at 6:15 p.m., in the Atrium of the Heidelberg Center for American Studies, Curt and Heidemarie Engelhorn Palais, Hauptstraße 120. Reception to follow. Raboteau comes to the HCA as the first recipient of the James W.C. Pennington Award. The award strengthens the ties that bind the Ruprecht-Karls-Universität Heidelberg to the United States and the international academic community. It was created in 2011 by the Heidelberg Center for American Studies and the Faculty of Theology, honoring the life of James W.C. Pennington. An African-American churchman, abolitionist and pacifist, Pennington received an honorary doctorate from the Ruperto Carola in 1849, the first black man to receive a degree of higher learning in Europe. Pennington, who wrote what may be the first history of African Americans, The Origin and History of the Colored People, as well as his own autobiographical slave narrative, The Fugitive Blacksmith, holds a special place in the history of the University of Heidelberg, connecting the university to American and specifically African-American history. This award thus pays tribute to Pennington’s work. The James W.C. Pennington Award is funded by the Dr. h.c. Manfred Lautenschläger Foundation, and is given to scholars who have done distinguished work on the African-American experience in the Atlantic world. The award fosters further research on topics important to Pennington. The university and the HCA are honored to give the first award to Raboteau, who carries on the history and tradition of Pennington. This entry was posted in Blog, Event and tagged African American, Albert J. Raboteau, events, faith, HCA, history, James W.C. Pennington, providence, slave narratives, speech, transatlantic on 05/06/2012 by Daniel Silliman.